Crazy 7 Classic Slot Guide & Review - Casino Answers! 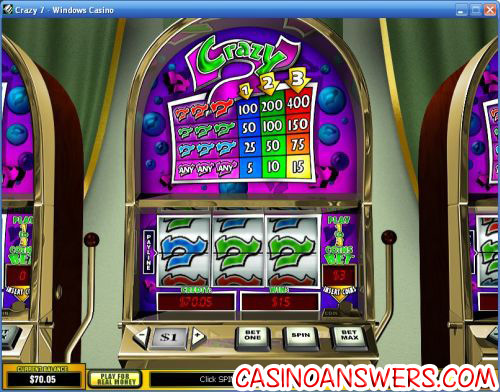 Crazy 7 is a 3-reel, 1-line classic slot machine from Playtech. You can play Crazy 7 at any Playtech online casino, including William Hill Casino and Casino Tropez. Crazy 7 lives up to its name in its design. It’s very multi-coloured with lots of crazy cartoonish sound effects that play when you spin the reels. It’s presented in a reel slot format, side by side with two other Crazy 7 slot machines. To play the Crazy 7 slot machine, you can first set your coin value. Available coin values are $0.05, $0.10, $0.25, $0.50, $1, $2 and $5. Then, you can hit “Bet Max” to play the maximum bet of 3 coins or “Bet One” to play one or two coins, followed by the “Spin” button. The minimum bet on Crazy 7 is a nickel and the maximum bet is $15 per spin. A cool feature on Crazy 7 is that you can quickly spin the reels by hitting the column that corresponds to your bet (1, 2 or 3). All of the symbols in Crazy 7 are 7s, each of different colours. There are blue, green and red 7 symbols. There are only three symbols in the game and four winning combinations. Payouts on the Crazy 7 classic slot machine are (1/2/3 coin payouts in parenthesis): 3 of any 7s (5/10/15), 3 blue 7s (25/50/75), 3 green 7s (500/100/150) and 3 red 7s (100/200/400). Go to the Menu and you will find an autoplay mode on Crazy 7. Settings are number of spins (up to 9999), delay between spins, to stop on jackpot win, single win more than (any value you enter), stop when your overall win is more than (any value you enter) and stop when your overall loss is more than (any value you enter). You can cancel the autoplay mode at any time. Get a 150% up to £150 signup bonus to play almost 200 different games including the Crazy 7 classic slot machine at William Hill Casino! Are US players able to play the Crazy 7 slot machine for real money? Unfortunately, players residing in the United States are unable to deposit and play for real money at Playtech casinos such as William Hill Casino. For an alternative, we think that slots players will love the US-friendly Go Casino with a $20,000 signup bonus plus four free slots tourney entry tickets. Do I need to download any software to play the Crazy 7 slot game? No, you can play the instant play version of Crazy 7 at William Hill Casino using Flash. If you have any problems playing the Crazy 7 Flash slot game, make sure you have the most recent version of Adobe Flash Player installed on your computer.